This photo is likely to generate a lot of Cinderella stories this week. 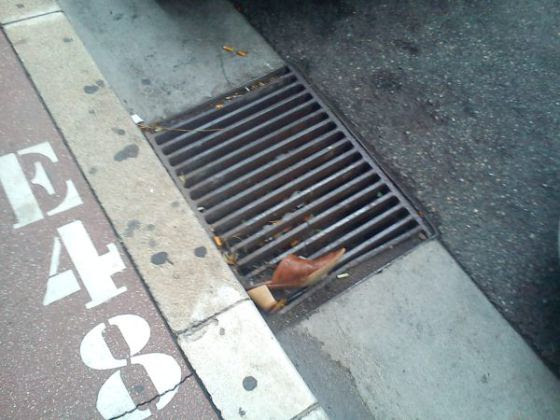 It is indeed a rough night when you lose a shoe and it ends up in the gutter. Or maybe it was a throw away all your worries and dance barefoot in the streets kind of night. In the harsh light of day, the mystery remains…what really did happen? Cindy pulled her head down into her ratty fur collar, trudging home. Black thoughts roiled in her head as she contemplated life’s injustices. Last night was just one more. He’d liked her best, she knew it. Then along came that floozy and he was gone like a wish at midnight. Her step-mom warned her not to get above her station. Gait uneven, she rolled along like a peg-legged pirate, her stupid half-shoe lost as she chased Mr. Dreamy out of the club. After a night in lock-up, a missing shoe was nothing. And assault was such a dubious term, really. Nope – Cindy is going to go home and have a stack of chores waiting for. Prince Charming isn’t riding up anytime soon. Poor thing! I loved it! I could almost see her limping along. Great job. An imaginative rework of a classic. Thank you, Mick! Glad you enjoyed it. I like what you’ve done with the tale. “Gone like a wish at midnight” – great phrase. There’s a tale to be told! Probably a true story. Should it read, “Her stepmom had warned her…”? This is so descriptive! Floozies and peg-legged pirates – I love it! Indeed, shoes like that are meant to impress after all.. and assault sounds a little harsh. They make for wicked weapons. Your piece this week was spot on. Really well done. They’ve gone overboard with assault. Now, you can get locked up just for looking at someone wrong. Mr. Dreamboat was probably a Shallow-Hal anyway. I thought so, too but when you heave your shoe at a person’s head, well all bets are off. I always like a Cinderella story! 🙂 Makes me smile. Thanks! I know it was an easy one to go with, but sometimes the story just won’t be stopped! Oh, my goodness! Where is Prince Charming when you need him? Love this take on Cinderella, Erin. Nicely done. Justice is a sliding scale – and not always in one’s favor. Thanks for reading! Gone like a wish – great line. A no good, very bad night. Thanks – I enjoyed writing this story. I took a few weeks off, struggling from lack of inspiration but this one popped into my head almost immediately. Love it when that happens! Masterfully written! Love some of your turns of phrases. And your last time is brilliant! Thank you!! Your words make me very happy – trying to paint the picture in so few lines is tricky. I’m glad it worked for you! Thanks, Dave. It was fun to write this week. It’s so sad when you can’t just beat someone over the head without calling it “an assault”. I’m so sick of the political correctness of these modern times! I am right behind you here, Dawn. I am certainly not getting in front when you are in this mood! I just love the tone of this. So deadpan, matter of fact, and resigned. Thank you! And thanks for the picture that inspired the story. Great fun to work with! What a clever take on Cinderella. Really well done. Thanks, Rochelle. Not everyone gets to wear the tiara, do they? She’s probably better off without him anyway! Nice (sad) twist to the story. Enjoyed!